There has been extensive behind the scenes clamoring for a house-hunting update (you know who you are). You ask, I deliver. 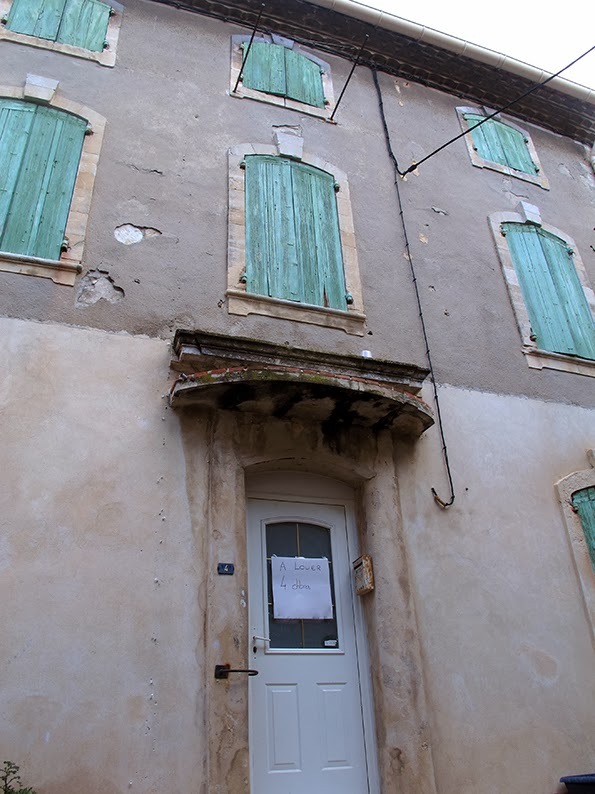 But we have been looking at so very many houses that it is too much to show you in depth, so I have picked just a few that didn't work out for various reasons plus a tasty treat at the end. 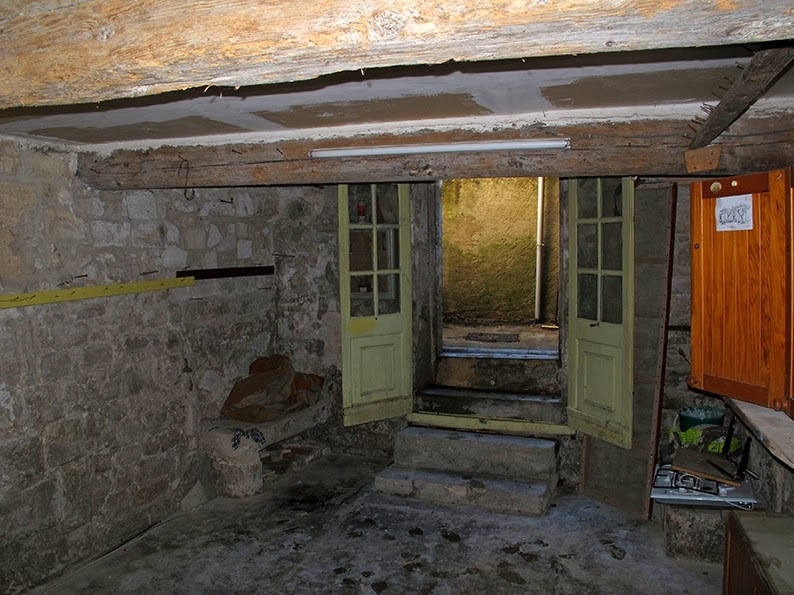 We were extremely tempted by the fine renovation work on this rental. It was, as the French say, un coup de coeur. 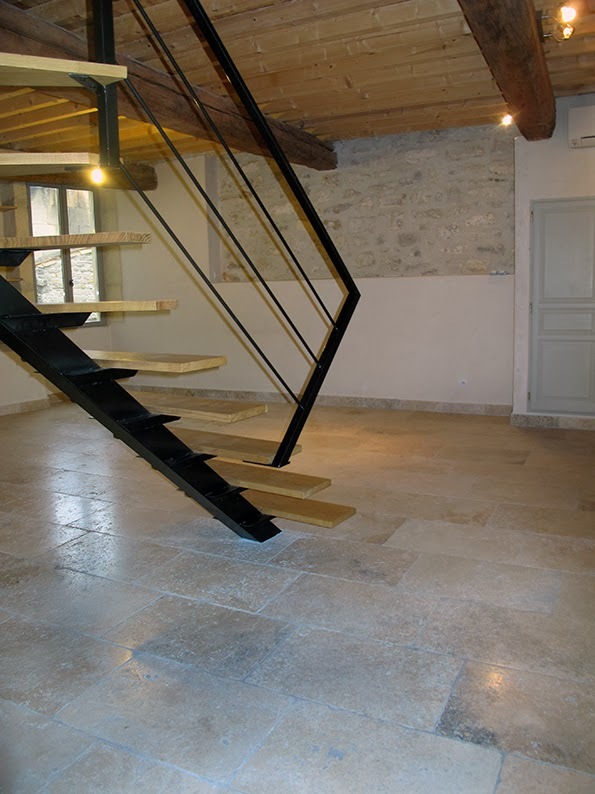 We both loved the mix of modern and ancient architectural elements such as the fireplace next to a sculptural oak and steel staircase. We visited on a day when it was pouring buckets and the sky was positively black but we could easily imagine this South-facing kitchen flooded with light. And yet *sigh* there were practical issues. Practicality, you are starting to get on my nerves, that is all I am going to say on the matter. I am warning you. For despite the fact that there is plenty of room, including a nifty mezzanine that could have been my yoga loft, there isn't the space that we need. I have mentioned before that we have certain pieces that are non-negotiables: our gallery printer, Remi's equipment, the monastery table. 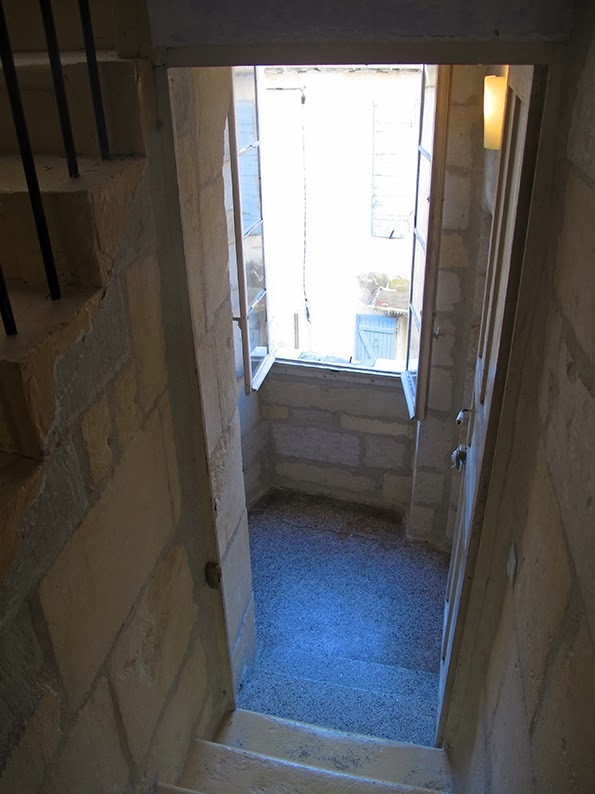 But we couldn't even figure how to get our sofas in through the tiny, anciently carved windows and doors. I have a feeling that the people that lived here before us must have a very zen futony lifestyle, mais alas, that is not us. A shame because I think that we just might have fallen for this otherwise. A bonus from the experience? The owner and his Sister are so charming that I am sure that we will invite them over for drinks once we do finally find a new place to live. In the worst case scenarios, I don't even take photos. And that is saying something as I am usually an obsessive clicker as Remi and I can both see the possibilities in just about anywhere. This smallish house has a lovely facade and a giant garage with a spacious back room that could be transformed into an office leading to a small outdoor area. 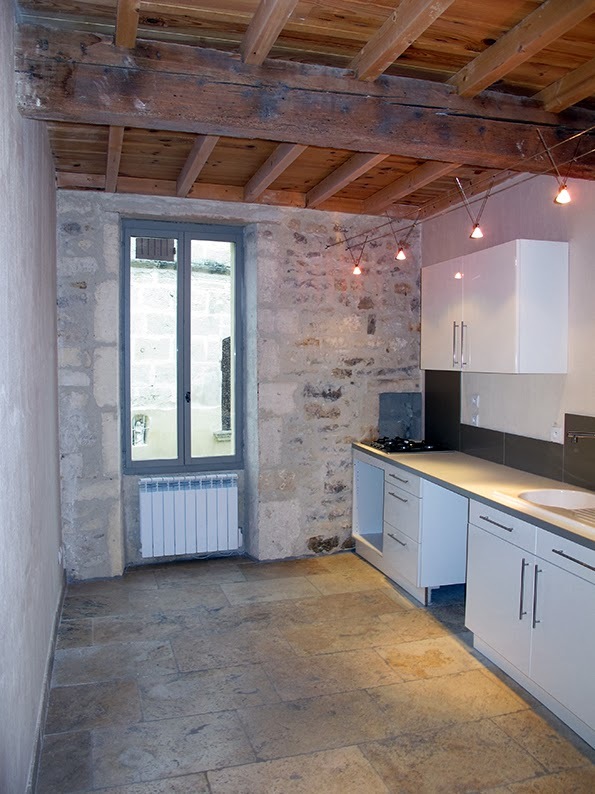 French doors, stone walls, wooden beams...promising right? 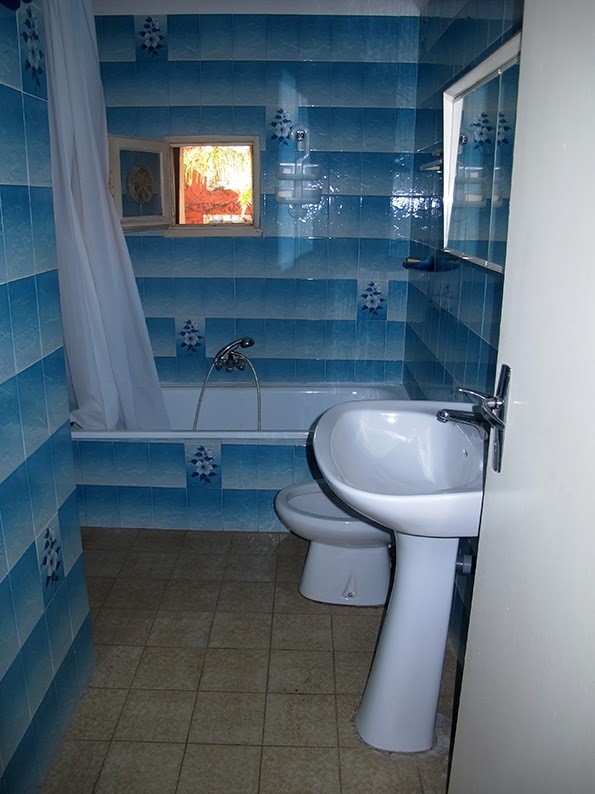 ...this is the bathroom. Enough said. We had difficulties arranging a visit with the charming young owner of this large and sunny home to rent for a very reasonable price. 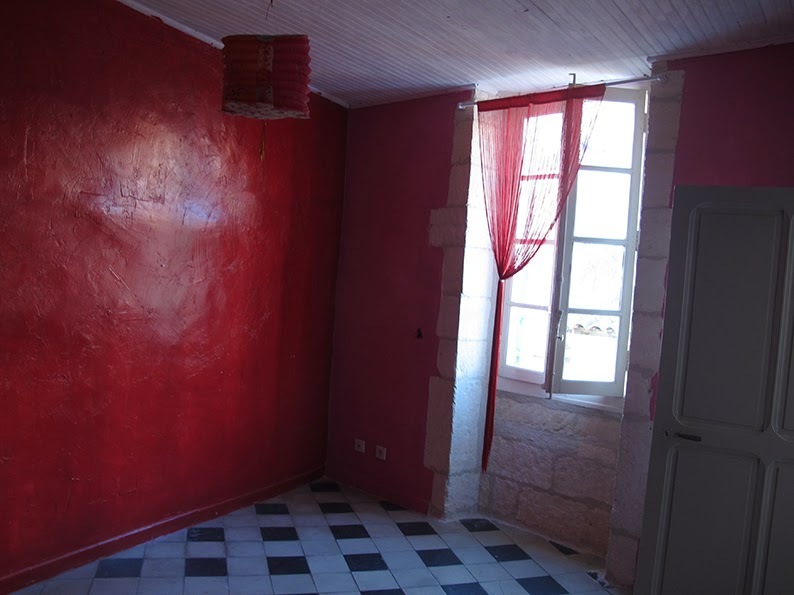 It turns out that one of the reasons why is that she is still in the midst of the renovating process, especially for the top floor. 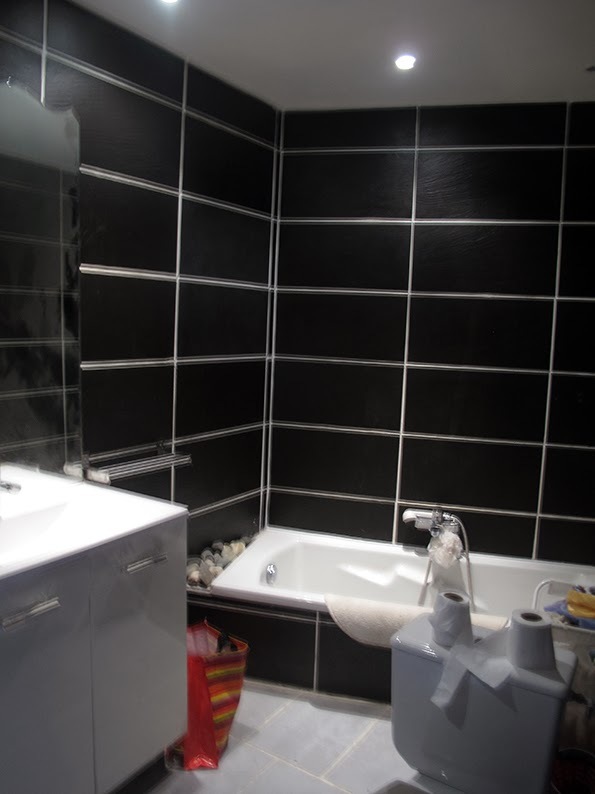 ...and then the toilet, floating randomly in the middle of the bathroom made the decision clear. Visits like this can be a wee bit depressing. Luckily, there exists the stuff that dreams are made on. 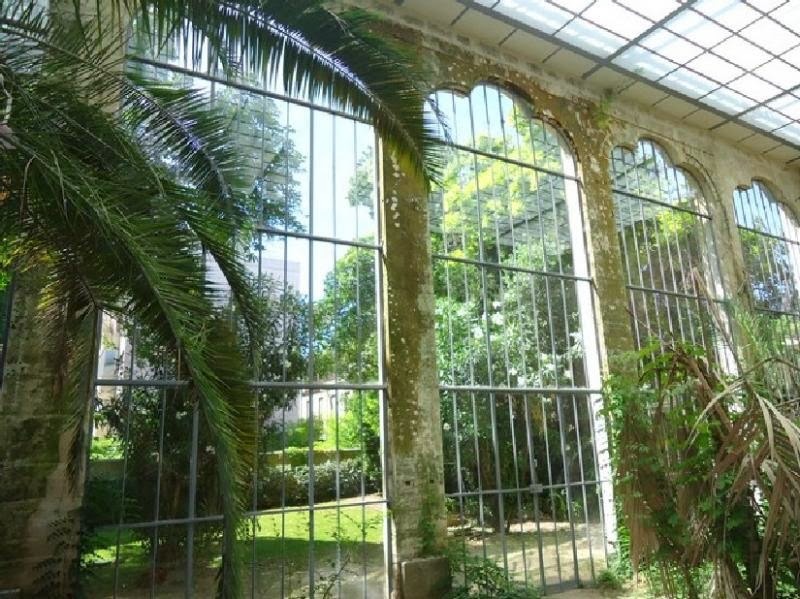 Such as this Orangerie in Nimes, just ever so slightly out of our price range at 3300€ per month. Remi found the ad for this yesterday and it knocked us both utterly speechless. It is amazing to know that such places still exist. Wouldn't you agree? Oh my, that makes my heart jump every time that I look at it. A fairy tale world if ever there was one. 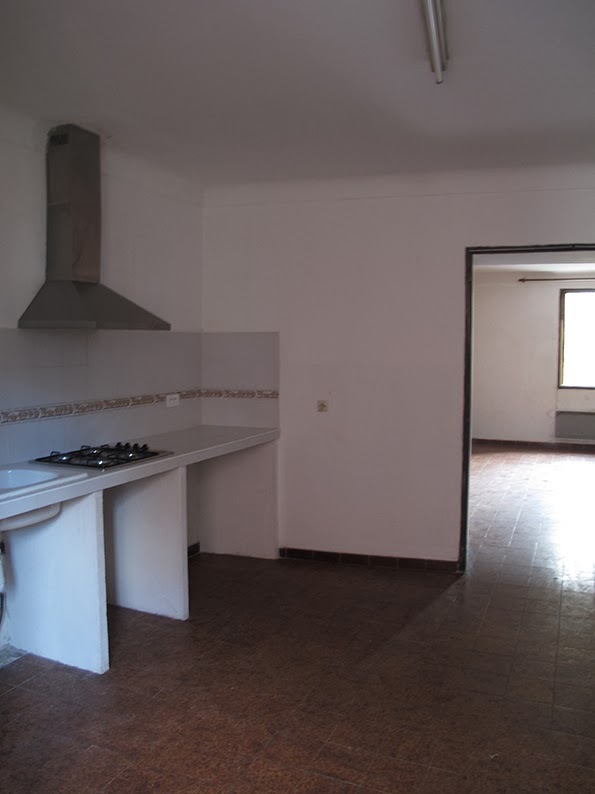 But perhaps you would prefer the garden apartment of a private mansion at 1900€ per month? Oh, how are we possibly on the verge of March? Tell me, how? So while I am a month early, with all of this rain then shine going on out my window, I can't help but share a favorite tune. Thank you for being here and have a lovely weekend everyone! I love all three. The first one would be my choice because of the light. If I really had to decide, then the overgrown garden speaks to my heart the most. Chuckling is the whole point! I smiled and I laughed when I saw this post. 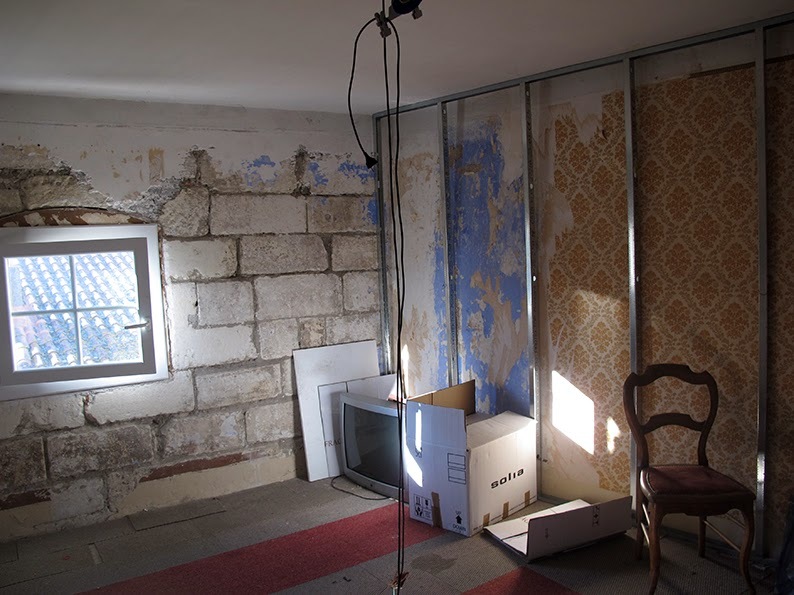 Is there anything worse and more emotional than a bad renovation? Walking away you say to yourself "how dare they ruin such a beautiful structure" We call those the DIY Weekender Killers. Can the puppies manage steep stairs? Our previous dog, Digger, could climb one set of stairs to our second floor farmhouse but one time he was crying as he had taken the back stairs and he refused to descend those steps. I will keep you in my prayers that you find the perfect place. 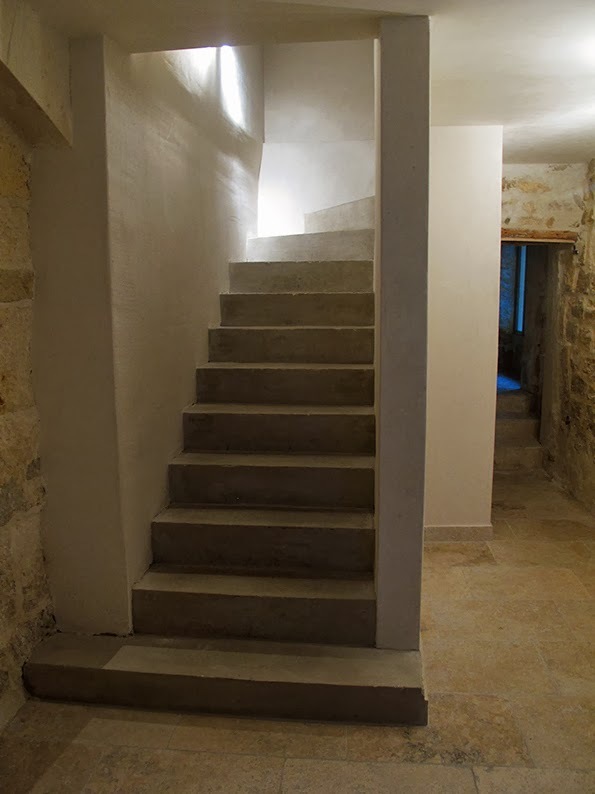 Helen, the stairs is something that I want to keep in mind for Ben. He is turning 8 this year and we currently live in a three story walkup. While he is still young, I don't want to wear out his hips if not necessary! Dear Heather?......SEE BELOW. As I wrote earlier, I spend half my time pre-figuring and anticipating how many of the current residents (dogs, humans) can "manage" the stairs.....and the degree to which they'll (eventually including, presumably, me) be able to do so. The house is 220 years old and has (between a 1790 core, two wing-additions from 1800, and two back wings from the 1830's.....with SEPARATE staricases leading up to what were slave/servant rooms) many levels. I recently had a party at which several folks were all too happy to bring in one whellchair-bound friend(I know...the politically-correct term is "Specially-enabled! "....but ask anyone who actually lives in a wheelchair, and he/she will tell you that there's nothing deliciously "special" about the situation). The good thing is that dogs happen to love that visiting friend, and he spent his time with them until I called everyone for dinner and found that he'd been marooned in the middle room. Hello Heather, I would go for the Orangerie, I would try to negotiate a lower price with the owner, sublet a room, live on beans and greens, don't travel, just stay in with Kipling and Ben and the husband, of course. 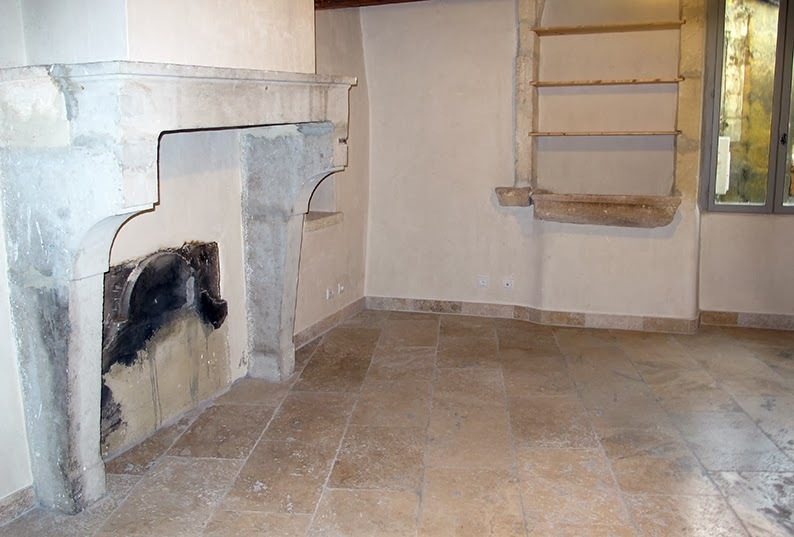 Or the farmhouse in the heart of Provence with those fantastic Gothic arches in the living room would be my next choice. ox, Gina . This is difficult, Heather. But, seriously, the prices seem really great. The Apilles with the architecture is wonderful, but as I am a water girl, and a property girl, the house with the pool seems to be the right one. One lives by the pool in warm weather, one entertains by the pool. Life outside is wonderful and the dogs would love it. But, alas, I am not a bit practical. I dream I will make everything wonderful with no thought of how much it will cost. In other words I go for the sizzle not the steak!!! What a selection! I actually like the "bourgeois" apartment with the lovely gray door and window trim. The price might allow one to have a larger travel and entertainment budget as well. Whatever property you select, I know it will be beautifully appointed and possess a special charm! Girlfriend! 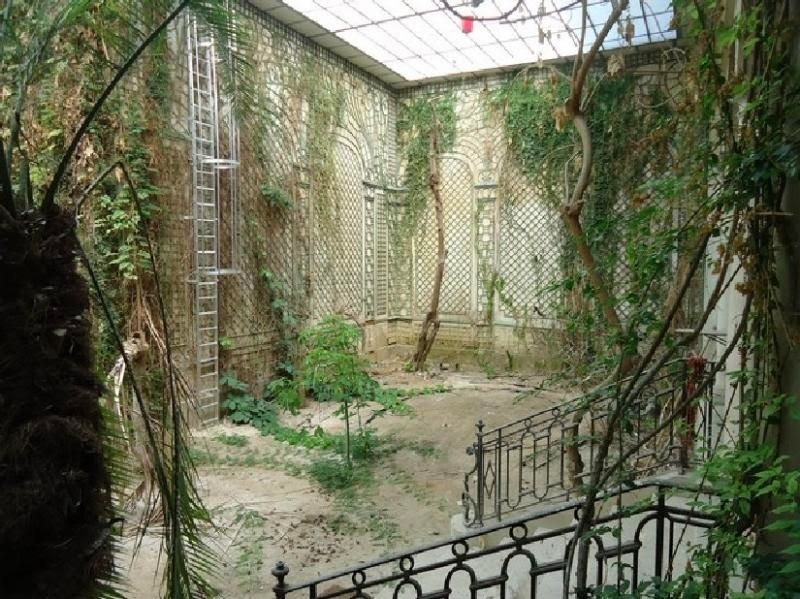 I love the overpriced, overgrown, Orangerie, but I'm also thinking, perhaps, a little too The Madwoman of Chaillot? I have a brain like a sieve. Why is it you can't stay in the lovely place you inhabit now? Oh, Good Lord, Vicki.....you and I should know each other; I took one look at that orangerie and thought "Madwoman of Chaillot"......or the "Southern Gothic",Bette Davis movie "Hush, Hush, Sweet Charlotte". Or the short version: we are getting kicked out because they sold the building. Oh, I got your email, Vickie. I forwarded it to Elizabeth Spencer, who would be flattered to hear from you (she's a very gracious lady, in addition to being a fine writer). Elizabeth's the Very First to admit/decalre that she wouldn't have ever gotten anywhere had it not been for the encouragement and support of older writers. Someday, read her good memoir (pulished in 1998, I think), "Lndscapes of the Heart". It's mostly about her early years as a writer. Gasp! Haven't even tried to open the links. 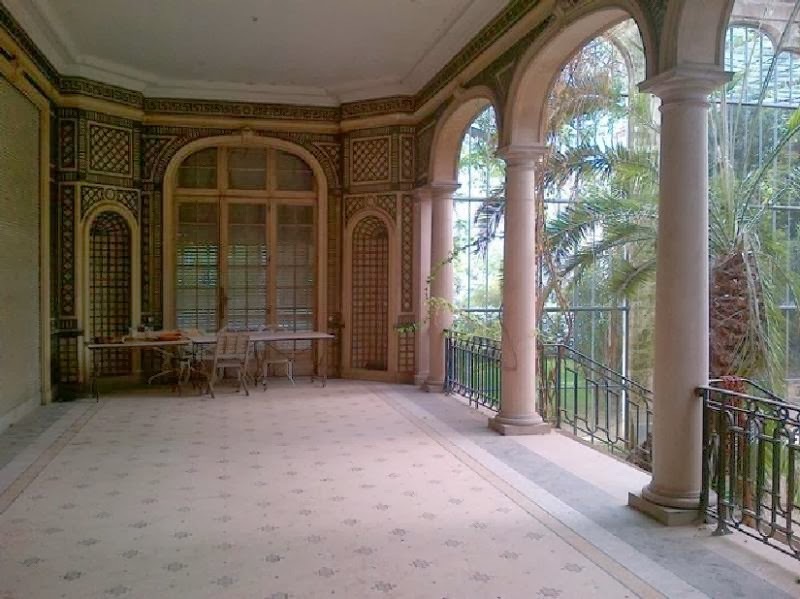 I'm head over heels in love with the orangerie: a once in a lifetime dream opportunity. I'm breathless. Woman faints from hyper sighing. Freudian slip: life in France, not like in France! THE MAS!!!!!!!! !THATS the one I pick! I could live in any of them honestly!The ORANGIERE Is STUNNING!!! !I hope ONE OF US takes that one and does not ruin it!It will happen……don't despair………Doesn't DAVID have friends who have friends that have a home who needs a lovely couple with two lovely guard dogs to sit?? ?DAVID……..are you on this?????!!!! "Doesn't DAVID have friends who have friends that have a home who needs a lovely couple with two lovely guard dogs to sit?? ?DAVID……..are you on this?????!!!!" Ummm, yes I do, actually, Elizabeth.......but that would require Heather and Remi's moving to rural, Upper Virginia horse-country. It's a lovely region, of course, but I've never garnered the impression that Remi's one of those swarthy, garlic-eating, God-knows-what-denomination, foreigners who are snapping at the bit for his lucky-chance to immigrate to the Glorious United States of America. Quite frankly, about half of the sort of folks with whom I'm friends here would rather be elsewhere. Your are right, though & as-usual, in thinking that the mas is the pick-of-the-current-lot. 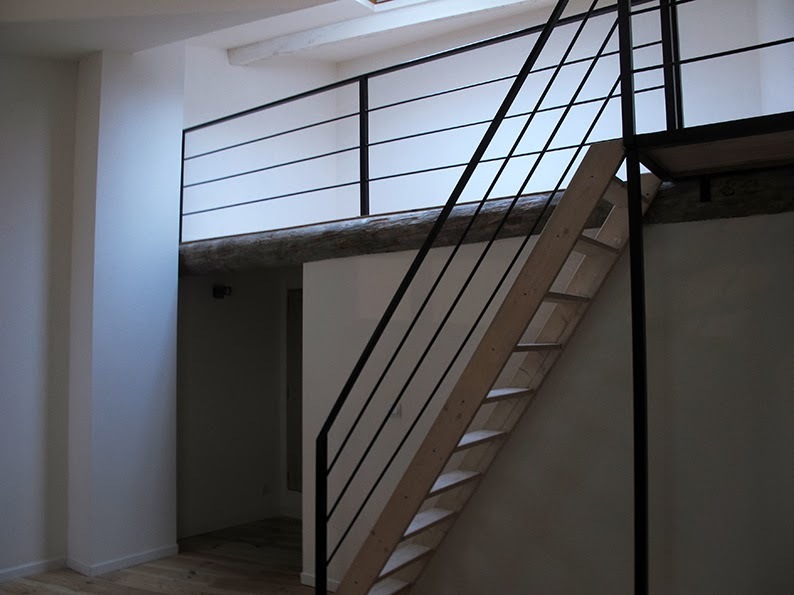 I took one look at the joint with the cantilevered, iron staircase and thought "Oh...NO!". That thing is built to spell the disastrous (if lingering) end of visiting, aging mothers-in-law (how do you spell "b-r-o-k-e-n-h-i-p"?) and/or aging golden retrievers.......and I should add that, at age 53, I ain't getting any younger, myself. Herve and I have many elderly and/or disabled friends, so practicality is, oddly enough, always high on my list of priorities. I went out yesterday to buy a set of ugly (but USEFUL) dog-steps sothat my oldest terrier can still sleep with the rest of us; today, a fellow's coming by to design the new wheelchair ramp I'll be installing at the back of the courtyard (for better or worse, two of my local friends are paraplegics, and I'm growing a bit tired of this routine of trying to figure out, during parties and dinners, which of the male guests are sober-enough to handle getting another wheelchair-bound guest up the five different flights of steps leading into this 220 year old house. It's one thing and one disaster to drop and destroy a fresh platter of Chaude Froid de Poulet Morvandelle all across the flagstones....but it's an entirely different & worse thing to do so to a 40 year old, really wonderful & hardworking, psychiatrist who happens to have been in a wheelchair since he was 15. YOU are so GENEROUS and kind hearted!LUCK BE WITH YOU ALWAYS DAVID!How can the dog steps be ugly?Are they plastic?? ?Paint and perhaps some molding could be added?Back to MISS HEATHER…………and thank you for agreeing with me on the MAS DAVID!How many bedrooms does it have?I have a feeling YOU could rent out a bedroom or two for a couple of weeks a month and make up the difference for your budget!! !I would definitely come……….am certain David would love to hang out with you too for a week and I'm certain there are a few more of your lovely SUBSCRIBERS out there who would jump on the opportunity!PENELOPE……..are you reading this?Remi could offer a photo course or day trip on how to catch the light!! !Are you with me on this……………?? ?I'm going to go look at it again!THOSE DOGS NEED COUNTRY…………and you CAN learn to drive!If I can YOU CAN! 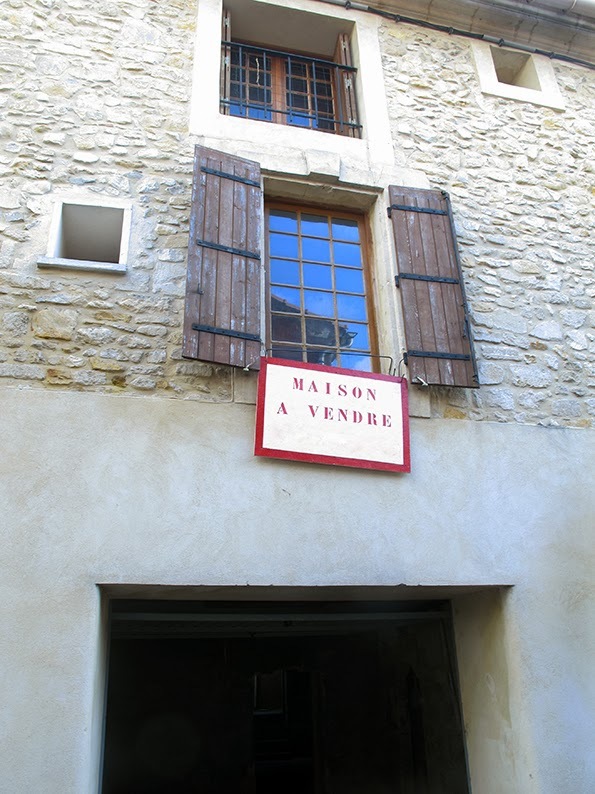 I do not read a word of FRENCH but I think it has 4 bedrooms!!! 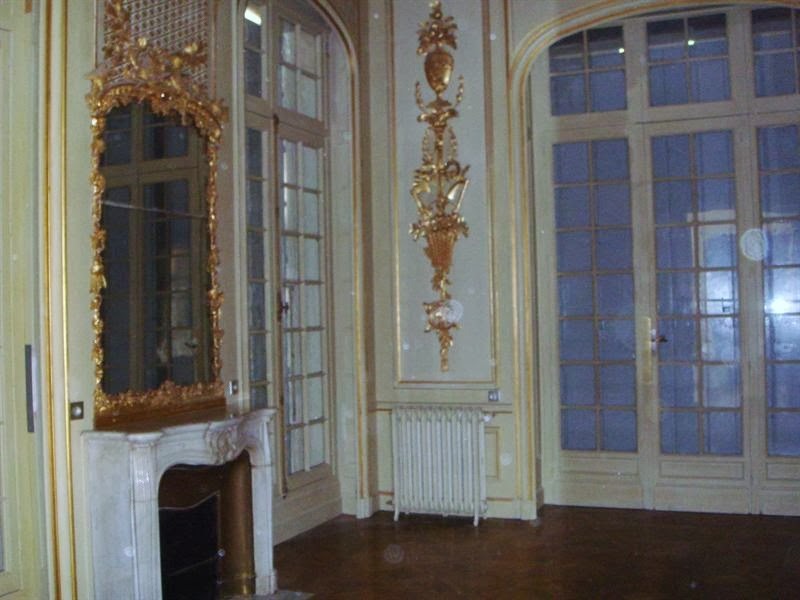 !Thats perfect.One for you and REMI,one for his office and two to rent out to all of us!I just LOVE that living room……..the outside pergola ain't bad either!PLUS, its CLOSE TO VICKI I THINK.It said something about St. REMY………. Can you tell I'm LOVING my idea!!!!!!!!!!!!!!!!!! !BED & BREAKFAST TRA>>LA!. As long as we are daydreaming here, I'll take the Orangerie! Beautiful post that lets the imaginations run wild - thank Heather! Sending good energy your way Leslie...just as you are sending to us! I am smiling over the words in the song. The only time I have been in Paris, it was April! What wine goes with jazz? Or is it brandy? i hope the whole process is not exhausting you and remi….for while it is fun to house hunt, it is also extremely emotionally tiring, i always find….probably because i always hunger for things out of our price range!! Bon courage. I am glad that you and Remi have a good eye for the possibilities and great patience too. I hope you find your dream home soon. 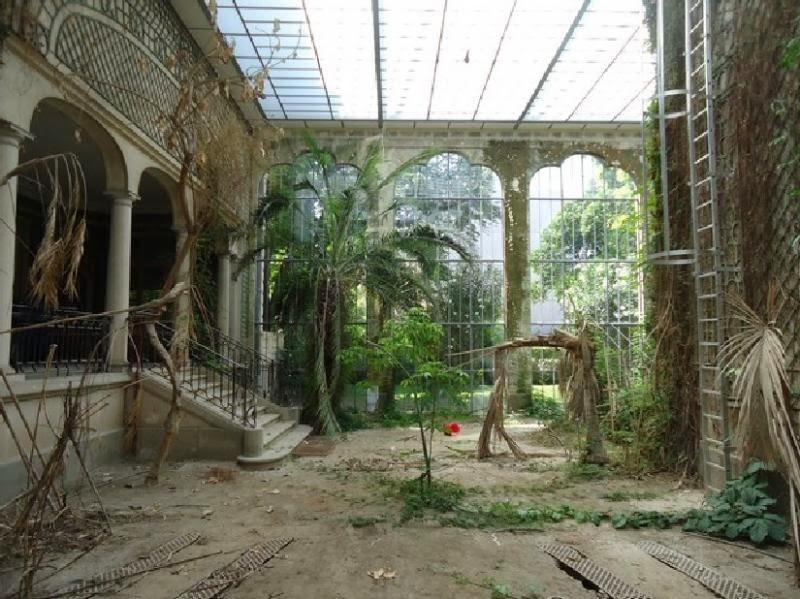 I can't get over that orangerie - but I am curious - are they going to clean that up before one rents it? As stunning as it is it seems like it would require a lot of work. PS I adore all this house hunting with you - it is like that show house hunters international! 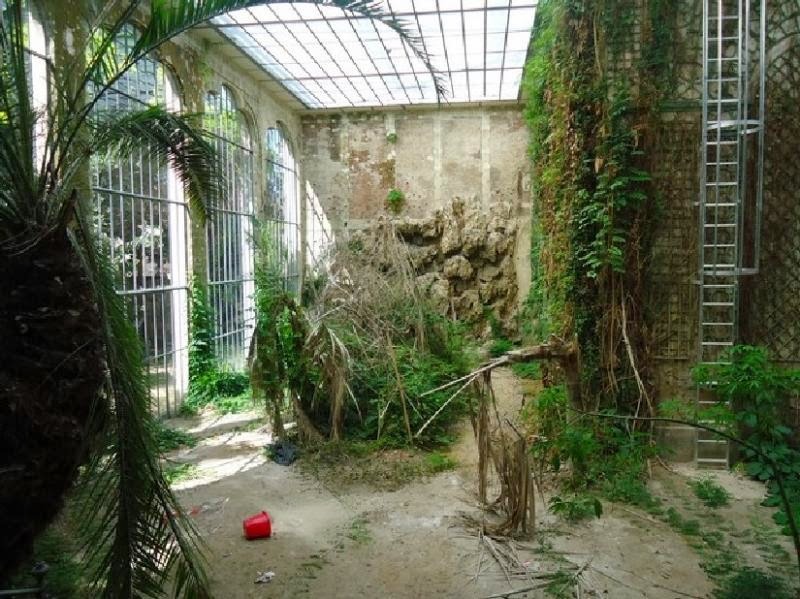 My vote is for the Orangerie. You can start a commune and grow your own food to keep costs down. I'd join you! Thank you! But I had to giggle as that property is roughly three times more than what we can spend. ;) But wow do you have amazing taste!!! And ps. Yep, Toulon is too far, we are looking for something one hour outside of Arles, max. I thought it might be on both accounts but wanted to pass it on. Being city (Amsterdam) based, I don't have a car and a lot of the overhead that comes along with a (very lovely) life like yours. Loved hearing the last near miss too. Good look and I know you are due for something wonderful! Thank you again...we will take those good wishes! And oh my, you live in Amsterdam? How utterly fantastic. 4th country in 5 years but one we hope to be in for a while. Wonderful people and a beautiful city. But as the workman are drilling in the upper house to mine all day, I do dream of a calmer country life. Though your last post looked anything but calm! We love the Normandy and Brittany, which aren't that far to get to but there is something so wonderful about the light down where you are. Fridays evening we often go to the Van Gogh museum near our house (no one knows it is open then!). I'll think of you, Remi and the pups when we go next and look the lovely scenes of Arles. Bon chance on your hunt! 4 countries in 5 years?! My goodness, that is fabulous. You must travel light! We have moved three times since 2005, with another coming up, as you know. Oh! I'm in love! 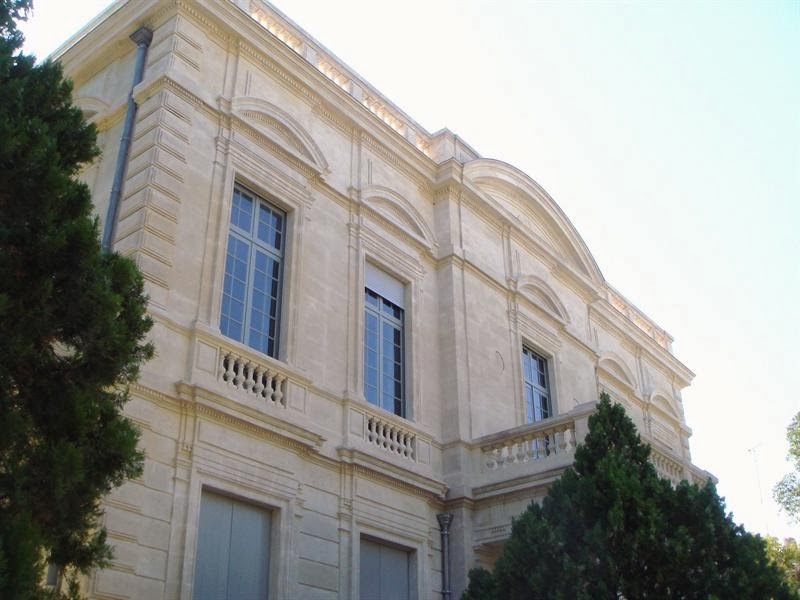 That Orangerie in Nimes, yes please! It's like something out of a movie!